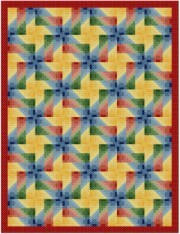 Stars and more stars...This cross stitch quilt pattern uses a basic block, spinning around and around to create spinning stars in bright warm colors. With Supplies: $22.42 You download the design. We will send you, 16 skeins of DMC Floss & Wichelt 14ct. 18" x 21" Aida (Ivory) to complete your project.